Learn to drive your Four Wheel Drive vehicle off-road. This full day course is designed to show you the features of your 4WD and to enable you to experience driving your vehicle off-road. Learn to drive your Four Wheel Drive vehicle off-road! This full day course is designed to show you the features of your 4WD and to enable you to experience driving your vehicle off-road in a safe environment. If you are new to 4WD, or have recently purchased a new four wheel drive vehicle, then the Introduction To Four Wheel Driving Course is for you. 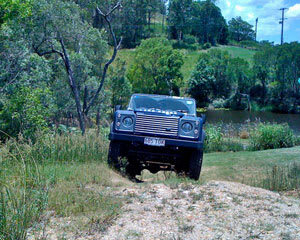 Take part in our Introduction To Four Wheel Drive Course, held at our specially designed off road track in Mt Cotton, Queensland. This course is designed in an informal and safe environment where you can get to know how to get the very best from your vehicle and from yourself. Discover new skills and prepare to explore the continent in your Four Wheel Drive with safety and confidence! We consider the environment and you will be learning from the only Four Wheel Drive Instructor in Australasia who holds the prestigious Master Tread Trainer certification from Tread Lightly, and who is certified by the International Four Wheel Drive Trainers Association.